Okay, okay. I moved into this artist collective 4 months ago, but I never got around to sharing anything other than a few Instagrams about the space. Walking into the warehouse, I can’t help but be overwhelmed by its massive size. At two stories with a max capacity of 700 people, there’s a lot of room for creative ideas to come to life. And because I love building furniture and designing spaces, my blank and empty bedroom served as the first creative project inside the house. Located on the second floor facing 9th street, I feel at home in my room. Sunlight drips through a wall of tall windows and covers the space in a forest of light ranging from the soft, morning sun to the husky amber night that lulls us to sleep. I don't have curtains because I'm convinced I'll make them, someday. Instead, I have a flimsy, crinkly, semi-transparent covering wrapped against the cold glass and light. It's not as terrible as it sounds, but curtains would be nice. I could have just bought a closet and chest drawer, but where's the fun in that? Furniture shouldn't be an afterthought, it can be with you forever, if you know what you want. With that in mind, I decided to build my own system. 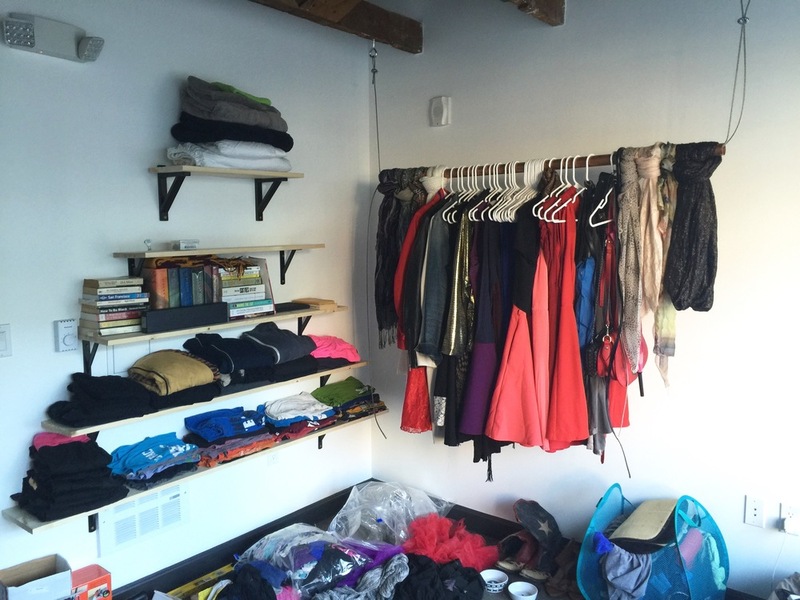 I quickly sketched out some ideas for my room and settled on this: use a copper pipe and suspension wire to hang a clothing rack from the exposed, wood beams and build an open shelving unit for folded clothing, books, and daily use items. All in all it took about 2 days of cutting, measuring, and building. Ready to see how it turned out? I'm also really into forts, and while I didn't have enough room to build a teepee, I did decide to make a delicate canopy. I'm still playing with the fabrics, so stay tuned for an update!